juicekit is a Open source software development kit (SDK) for developing Information Experience applications. It's a toolkit built on Adobe's Flex SDK to make it easier for web designers and software developers to build visually compelling Information Experiences applications. It contains a wide variety of development components for controls, visualizations & utility classes that are easy to implement & aesthetically pleasing. These components also used independently, within other applications, or assembled together to create full applications. 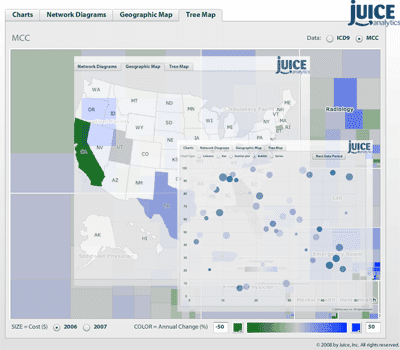 Federal Recovery Act Treemap - This is an application of the JuiceKit SDK Treemap visualization to better understand the components of the American Recovery and Reinvestment Act of 2009. Economic Census Data Treemap - Every 5 years the NAICS takes an economic census. We've used this data to demonstrate using JuiceKit to implement the treemap with additional controls to change some of the display parameters.